Nina Berman. 'Spc. Adam Zaremba, Ft. Riley, Kansas,' 2004. Color chromogenic print. The Honolulu Museum of Art presents the contemporary photography exhibition Courage and Strength: Portraits of Those Who Have Served. The exhibition features work by Nina Berman, Ashley Gilbertson, Peter Hapak, Tim Hetherington, and Suzanne Opton—five internationally acclaimed artists who have explored the contradictions of war through powerful images that provide an intimate, personal look at American men and women who have served in Iraq and Afghanistan. Hetherington, co-director of the award-winning documentary Restrepo, was killed while on assignment in Libya last year. Over the last decade, the world has seen in the media thousands of images of war, mostly in the context of the theater of combat and its aftermath in Afghanistan and Iraq. Much less covered are images that convey the stories of returning and deceased soldiers and war’s long-lasting repercussions on their everyday circumstances and those of the survivors of the dead. Museum admission is free for active-duty military personnel and their families, with ID, for the duration of the exhibition. This exhibition is supported by the Atherton Family Foundation. We want to hear from you: The museum has created a blog for viewers to share their Courage and Strength experience. Did the exhibition speak to you, did it evoke memories or feelings? We invite you to share them here. Read the ARTnews article on art and veterans. American Nina Berman is a documentary photographer with a primary interest in the American political and social landscape. Her photographs in Courage and Strength are from Purple Hearts: Back from Iraq, her series of photographic portraits and written interviews with American service members severely wounded in Iraq. Photography sessions took place in the subjects’ homes, at military hospitals, or on bases across the U.S. The images provide a stark awareness about the physical and psychological challenges facing returning soldiers and a sober understanding of the realities of war. In 2010, Hungarian-born American editorial photographer Peter Hapak did an assignment for Time Magazine to accompany an article titled The Art of War: Honoring the Fallen for a Lifetime, focusing on commemorative tattoos that Iraq and Afghanistan Wars service members get “to honor fallen buddies, venerate their units, reiterate war mottos, engrave themselves with religious prose, or dream up art that reflects experiences they might not talk about,” as Mark Benjamin, the author of the article, wrote. Through Al Herman, the owner of Capitol Tattoo in Silver Spring, Maryland, near Walter Reed Army Medical Center, Hapak was given access to his military clients and photographed the tattoos they’ve gotten to acknowledge their experiences and help process their feelings in transition back to civilian life. British-American photojournalist Tim Hetherington’s photographs in the exhibition are intimate portraits taken over several months in 2007 and 2008, when he was embedded with American troops stationed in Afghanistan’s Korengal Valley. Describing the images, Hetherington said: “It’s all about the men. I didn’t want to pretend this was a book about the war in Afghanistan. It was a conscious decision. My book comments on the experience of the soldier. It’s brotherhood…to see the men in an intimate way…To get to know them and how they lived.” Hetherington’s experience in Afghanistan also became the basis for the documentary Restrepo, which he co-directed with Sebastian Junger. The film was nominated for an Academy Award in 2011 for Best Documentary Feature and won the Grand Jury Prize for documentary at the 2010 Sundance Film Festival. Hetherington was killed in April 2011 while on assignment in Ajdabiya, Libya. Australian photojournalist Ashley Gilbertson spent several years in Iraq, covering the war for The New York Times. His images were published in the book Whiskey Tango Foxtrot: A Photographer’s Chronicle of the Iraq War (University of Chicago Press, 2007). 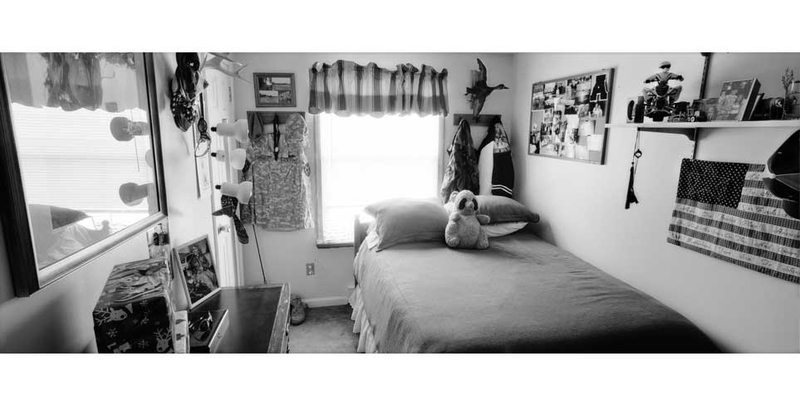 Since then he has been working on a very different project, Bedrooms of the Fallen, depicting the seemingly untouched bedrooms of young service members who never returned from the wars in Iraq and Afghanistan. Through the extraordinary cooperation of families of young men and women who left their childhood homes when they joined the service, Gilbertson has created “portraits in absentia”— stark black-and-white, panoramic images of these private retreats. The quiet spaces, filled with the paraphernalia of youth, speak eloquently of their former inhabitants. Works from two series by American photographer Suzanne Opton are included in the exhibition. 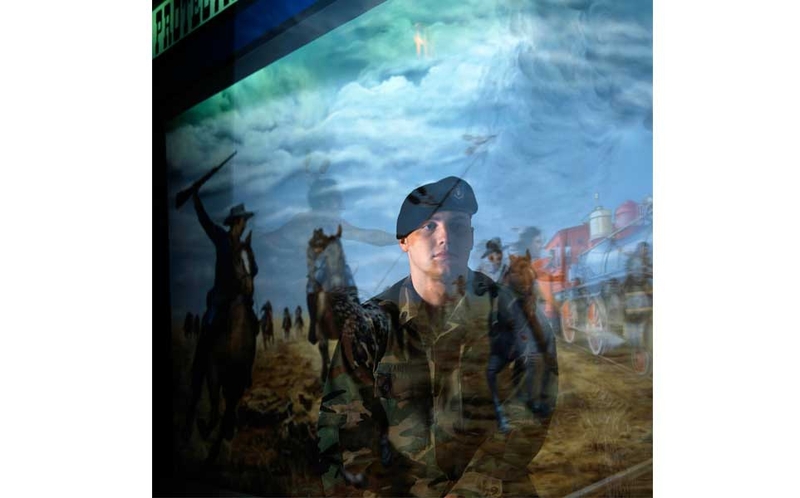 Soldier, for which she photographed soldiers at Fort Drum army base in New York, comprises close-up portraits of soldiers who have served in Iraq or Afghanistan. About these images Opton has said, “We all experience strategic moments when we feel most alive. Whether transcendent or horrific, these are the moments that we will always remember. In making these portraits of soldiers, I wanted to look in the face of a young person who had seen something unforgettable.” Opton had the subjects lie on their stomachs, with faces turned to the camera. The portraits convey a sense of rest and relaxation as well as vulnerability and strain. Opton’s Many Wars series focuses on veterans who served in Iraq and Afghanistan, most seeking treatment for combat trauma, and the images are accompanied by texts written or spoken by the veterans.